It’s pure coincidence that Coco, a vast and colourful celebration of Mexican culture, comes out at a time when political agendas seem dead set on dividing the United States and Mexico even further, with vile xenophobia and disdain toward migrants seeking a better life for themselves running rampant as it sadly always has been. While it may seem that the release of Pixar’s latest masterpiece is a little too perfectly timed, it’s actually been in development for roughly six years, when a far more charismatic and competent man was President and all seemed fair in the world without any possibility of anyone coming along and buggering it up royal (ah, simpler times). 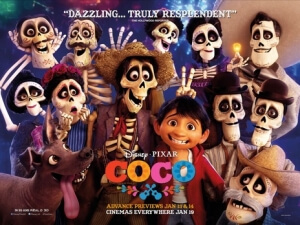 But even if the folks at Pixar somehow knew of the hateful rhetoric against Mexico that was to later come along, providing an anti-xenophobic political statement with Coco was never on their minds; instead, like many of their other films, they wanted to tell a fantastic story with colourful animation, fun characters, and a sweet emotional core, which I am glad to say they have once again pulled off with this film. Set in a small Mexican town, a young boy named Miguel (Anthony Gonzalez) has a burning passion to music, and to follow in the footsteps of his idol, the late superstar Ernesto de la Cruz (Benjamin Bratt). The problem is, Miguel’s family has forbidden any kind of music for generations, after his great-great grandfather abandoned his wife and daughter to pursue his dreams of becoming a musician. One day, which just happens to be Día de Muertos aka Day of the Dead, Miguel makes a possible discovery about his ancestry, and when he sets out to defy his family’s wishes and enter a local talent contest, one thing leads to another and suddenly he finds himself in the Land of the Dead, populated by the skeletons of people long since passed. To get back to the Land of the Living, he must accept a blessing from one of his ancestors, which leads him on a journey through the vast landscape he now finds himself in, accompanied only by street dog Dante and a trickster by the name of Héctor (Gael García Bernal) who offers to help him. Sure, it adopts a similar formula that most Pixar films seem to have – an outsider must travel through a vast and interesting landscape to achieve their goal – but it is, after all, a formula which if done right can work wonders, and in this case it really helps tell a vibrant and extremely entertaining story that is universal and easy for anyone to get emotionally attached to. You’re on board with these characters because they are very likeable and have clear goals that you understand why they set out to do what they do, and when the emotional moments come, they are earned because enough time has been spent setting up these developments that you actually care about what is happening. I seriously have no idea how Pixar manages to crank out story after story with a fairly high success rate, but when they hit that bullseye they hit it hard, and that winning streak delightfully continues with Coco, which even when adopting a standard formula morphs it enough to make it more unpredictable and even original. By far, this is also one of Pixar’s best-looking films, with the animation seriously taking things to a whole other level in terms of colour, speed, texture, and even the most minor of details that just pop out of the screen. Before we even get to the Land of the Dead, which represents one of the most vibrantly visual environments that Pixar has ever produced (seriously, the colours everywhere are just mesmerizingly gorgeous), we are treated to some of the company’s most naturalistic human animation ever, from the mere wrinkles on an elderly family member, to the smallest dimple in a character’s left cheek, to how a character plays guitar which is so lifelike it’s completely uncanny. They set a benchmark for how Pixar animates its human characters, especially the young and the old, and when we do eventually reach the more fantastical Land of the Dead the impressiveness doesn’t stop there; there is great texture in the very bones that make up skeleton after skeleton, including little patterns in the sugar skulls and how they tend to fall apart and then come back together again, with each major character we meet having their own unique design and impeccably brought to life by the wonderful team of animators underseen by director Lee Unkrich. The whole film is just a giant celebration of Mexican traditions and cultures, which are represented with such care and love that make it a serious love letter to this part of the world and the many things they celebrate (hell, this movie even uses Gabriel Iglesias right, which up until now not many other animated family movies have managed to do). Once again, the timing of this movie’s release amidst a sheer wave of political hatred towards Mexico is entirely coincidental, but regardless it arrives at a very heated time where relations between them and the United States are more toxic than they ever have been, and if anything this movie and the success it has currently experienced from the stellar box office to winning award after award for Best Animated Film, serves as a perfectly timed reminder that the acceptance and appreciation of other cultures and ethnicities outside our own has never been more important. With this film, however, Pixar has also crafted a wonderful story that’s been beautifully brought to life to make that message even stronger. Coco is another major triumph for Pixar, as it boasts some of the most colourful and fantastically crafted animation the company has yet produced, and tells a wonderful story with fun characters and a powerful emotional centre.